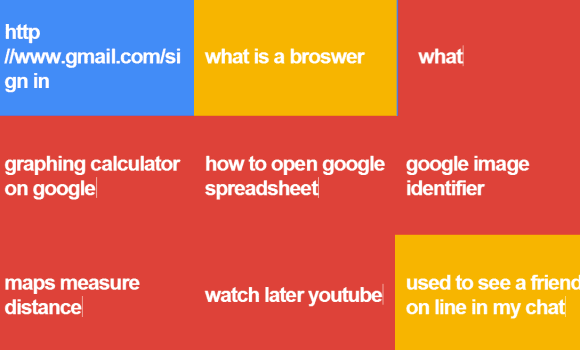 If you like the full-screen Google Trends visualization that shows the latest hot searches, there's a cool project that uses the same animations to show Google Analytics searches in real time. It's made possible by the recently launched Google Analytics Real Time Reporting API and it shows your site's internal searches, as well as some of the Google searches that lead to your site. "You can setup your own site visualization in only two steps: first authorize access to your Analytics data, select your site, and set the query parameter for your site searches, usually the letter q. Click save, and see your visitor's searches appear live as a beautiful visualization," explains Yvo Schaap, who developed the service. 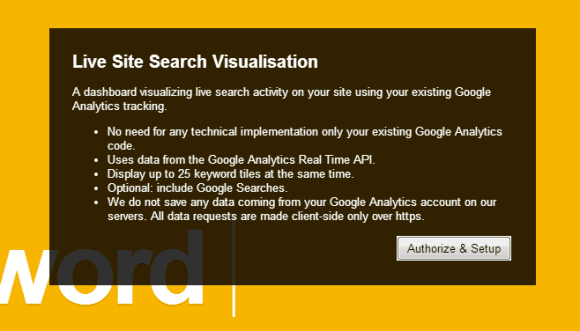 According to the site, Live Site Search Visualisation is "a dashboard visualizing live search activity on your site using your existing Google Analytics tracking." It also shows Google search referrals. Just like in Google Trends, you can click the top-left corner to select the number of keywords that are displayed at a time. Just in case you're worrying about this, the site does not "save any data coming from your Google Analytics account on its servers. All data requests are made client-side only over https."